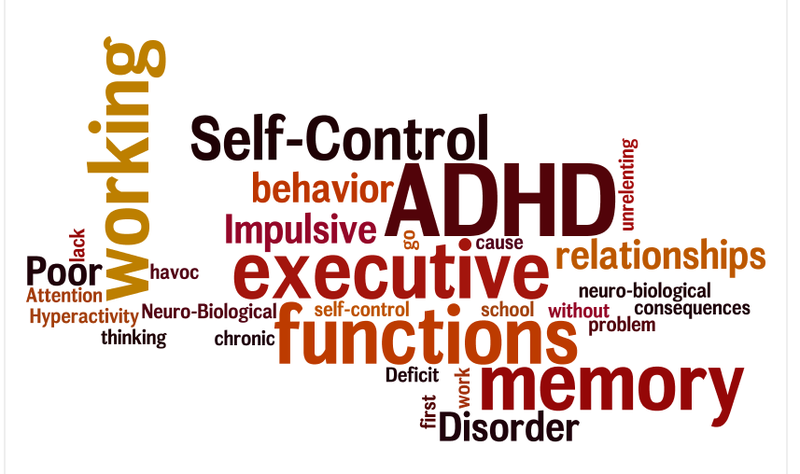 ADHD is a problem with "working memory," "inhibition," and "executive functions." Just what exactly is ADHD ? ADHD is the short abbreviation for "Attention Deficit Hyperactivity Disorder", which is a diagnostic label for children with a particular neuro-biological disorder. About nine-percent of children and teens have this condition in the United States, making it one of the most common childhood behavior disorders. Of all children referred to counselors or other mental health professionals, more are referred for ADHD than for any other condition. ADHD is a chronic and unrelenting problem. And those children, teens, and even adults with ADHD will have problems in many of the areas of their life, including home, school, work, and in relationships. Our new eBook on Marriage and ADHD may be helpful for those adults who are married to someone with ADHD and find that they are struggling a little bit in their marriage. See more below. Though ADHD may change a bit through the years as the person matures, it will usually last into adulthood in one way or another. "ADHD" is a neuro-biological disorder. That means that it is not the result of bad parenting, or watching too much T.V., or a lack of either discipline or love by parents. ADHD has neuro-biological roots. And there are very strong genetic factors that influence both brain function and development. Inattention - causing people to have problems paying attention to routine or boring tasks, or staying focused on a task long enough to finish the task, especially if the task is not very interesting. The person might be able to focus on interesting projects or entertainment such as video games for long periods of time, but it is the mundain tasks of life that are very difficult. Impulsivity - which is a lack of self-control. Impulsive behaviors, or choices, can cause havoc in relationships, work, school, or life. Saying things, or doing things without thinking first, or considering the consequences, is a pretty classic symptom of ADHD in both children and adults. Hyperactivity - which is being "bouncy" like Tigger. They are always "on the go," and restless. This is mostly seen in younger children, and this is the symptom most likely to be "outgrown" as one matures. And some with ADHD are very easily bored and distracted, unless the task at hand is very stimulating, like a video game those with ADHD are often easily bored by mundane tasks like homework, or chores around the house. First, go and have a look around the ADHD Information Library at Newideas.net. We have over 200 articles filled with tips, insights, and ideas to help you understand ADHD just a bit better. For more information on how to reach Doug Cowan, visit http://douglascowan.me. Second, you can start trying some of the alternative treatments that don't involved any medications. If they don't work, then you can always try medications later. And then know when it is time to talk with your doctor or other health care provider, and see what they think. Attend and Extress are two excellent over the counter products to get. You can get them at nutrition2you.com. Also start a focused eating program for ADHD. Learn what to eat and what not to eat to optimize your brain. You can get that at ADHDdiet.info or just look below. Try these things for a few weeks and see how they help. Our ADHD Diet and Eating Program has been available on the internet since 1997, and has been used by hundreds, or thousands of families each year since. It has always been available for free. We have revised it, and updated it for 2013 and now have all of the elements available in a PDF eBook format for just $20.00. If you cannot afford the $20, the older version of the ADHD diet is still available for free at the ADHD Information Library at Newideas.net. And when you get the eBook, you can also try the ADHD Newsletter for six month – FREE. The newly revised ADHD eating program has enough improvements and enhancements that we think its worth the small investment of $20. After all, an hour with our nutritional consultant is $200, and an hour consultation with therapist and author Dr. Douglas Cowan via Skype is $150. So we believe this is good information that may just help to solve one or two problems for you, and help you to think differently about how you eat, and what you eat every day. Get our updated ADHD Eating Program. It's in PDF format for easy download and printing. You can begin using the concepts and information just minutes from now! When you buy it through PayPal you will automatically be directed to our download page. Simply download, and print, and get started today! Are you married to someone with ADHD? Are you looking for ways to improve your marriage right NOW? This eBook in PDF format by Marriage and Family Therapist Douglas Cowan, Psy.D., will help you to understand the dynamics of marriage with ADHD in the house, and gives practical tips on what to do next. for IMMEDIATE download. Get it NOW. Read it TODAY!